The new McLaren MP4-12C GT3 will be the first McLaren car built for FIA* GT series racing since the McLaren F1 GTR finished production in1997. The 12C GT3 is based on the new MP4-12C high-performance sports car and a team of engineers, designers and test drivers with vast experience in Formula 1 and GT racing has been assembled to undertake the process of adapting the carbon chassis-based 12C to racing specification. 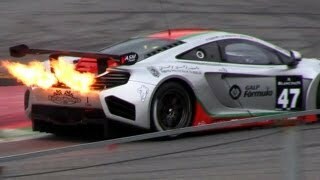 Martin Whitmarsh, McLaren Group Chief Executive Officer said: “McLaren has racing in its blood and it was a natural step to take our MP4-12C road car and turn it into the most reliable, efficient and easy to drive GT3 car. Every car on the grid will have its performance balanced by race rules, meaning our objective must be to select a technical specification that ensures any driver is able to access the 12C GT3’s performance limit with ease. “We have worked with CRS Racing to ensure the 12C’s design and development programme is as close as possible to one McLaren Racing would employ in developing a Formula 1 car. The team at CRS is well qualified to shape decisions in this area as they have an outstanding record in racing GT3 cars, and understand what is required to be successful in that level of competitive motorsport. “In return, McLaren Racing is able to bring new levels of technology to GT3 racing. No other GT3 car in 2012 will be supplied with a road-car carbon chassis, or a steering wheel and other associated technology from a Formula 1 car. McLaren GT aims to deliver the highest quality, most reliable and most driveable car on the GT3 grid when 20 cars are delivered to privateer teams for racing in Europe in 2012. The unique combination of McLaren and CRS Racing’s technology and development methodology is matched by McLaren GT’s appointment of experienced and successful racing drivers to develop the 12C GT3 at challenging races over the 2011 season. McLaren GT plans to debut the new MP4-12C GT3 at this season’s Blancpain Endurance Series race at Spain’s Circuito de Navarra, followed by Magny-Cours in France and Silverstone in England. As part of the development programme for the 12C GT3, McLaren GT also expects to enter the Total 24 Hours of Spa endurance race. CRS Racing Team Principal Andrew Kirkaldy will be joined by 2010 Vodafone McLaren Mercedes test driver Oliver Turvey and Portuguese racing driver Álvaro Parente in the McLaren GT driver line-up for the 2011 development programme. McLaren fans eager to see McLaren’s first GT racing car since the legendary McLaren F1 GTR can expect to see the new 12C GT3 driven up the famous Hill at Goodwood Festival of Speed from 01-03 July 2011. McLaren GT comprises a team of designers, engineers and test drivers with vast experience in developing successful race and road cars. Marcus Waite, McLaren GT Chief Engineer, began his career working with the McLaren Formula 1 Simulation Group. A move onto the Formula 1 team where he was Senior Test Team Engineer for many years was then followed by his appointment to McLaren Automotive as Test Team Leader responsible for the new MP4-12C sports car. Combining practical experience of Formula 1 car development methodology and a deep understanding of the 12C road car’s technical specification is invaluable to McLaren GT. Marcus Waite said: “We have defined the technical requirements for the 12C GT3 in the McLaren simulator and I am pleased to say that feedback from the three new drivers in the team means we can immediately focus on fine-tuning the set-up of the car, rather than address any fundamental changes. “There is no substitute for having the 12C GT3 pound around the European circuits on which we plan to race, so that is exactly what we are doing. A varied circuit programme is vital. Circuito de Navarra in Spain is a great track: a mixture of slow and fast corners and long straights, meaning the new engine calibration we are testing has to undertake relentless accelerations from low speeds. A successful shakedown there means we are now confident of powertrain durability. “We followed Navarra with a test session atAutódromo Internacional do Algarve in Portugal. The long, sweeping and fast bends of that circuit were a good test for the new oil tank we have designed for the 12C GT3. The oil is constantly moving and yet the new tank proved robust in that environment. On March 4th, virtually 30 years to the day that the world’s first carbon-based racing car, the McLaren MP4/1 was shaken down at Silverstone (March 5th 1981), the 12C GT3 also debuted at the UK circuit. One week later, it took to the Circuito de Navarra in Spain for its first FIA circuit test. These shake down and test sessions followed months ofextensive testing on simulated versions of international race circuits including Silverstone, Circuit de Catalunya and Paul Ricard. In simulated tests, McLaren GT was able to fine-tune engine calibration, power steering, spring rates, weight distribution, gear ratios and differential settings. Following the Spanish shakedown session, Andrew Kirkaldy Team Principal at CRS Racing and McLaren GT Project Manager, said: “The performance of the car in Navarra was testament to the work we were able to do in the McLaren simulator in selecting the right set-up for the car. The virtual and real world versions of the 12C GT3 felt near-identical. “The new aerodynamic body panels and features designed for the 12C GT3 are of outstanding quality and markedly increase the dynamic performance of the car. This level of quality can only be achieved using FE design analysis and knowing how best to apply carbon fibre. McLaren has this knowledge in abundance. A new aerodynamics package produced entirely from carbon fibre has been developed by McLaren Racing in compliance with GT3 regulations, incorporating a new front splitter, door blade, rear wing, diffuser and louvres in the front fenders. In partnership with McLaren Applied Technologies, McLaren GT plans to offer its clients the opportunity to develop their 12C GT3 using bespoke programmes in the McLaren Simulator. Chris Goodwin said: “The simulator is a huge competitive advantage to McLaren Racing in developing its Formula 1 cars and to McLaren Automotive in developing its future range of sports cars. Racing experience and development tools have played a key part in readying the 12C GT3 for its 2011 race programme. But, before the racing car takes to the competitive grid, McLaren, in the form of McLaren Automotive set out to develop a high-performance sports car that set new standards for speed, handling, efficiency, braking and driveability: formed from an obsession for aerodynamic purity and lightweight engineering. 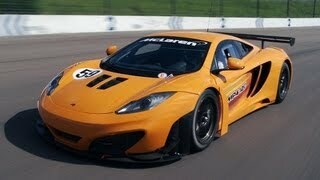 Assets and goals that make the McLaren MP4-12C a perfect road car from which to develop a race-winning GT car. Once plans were agreed to take the 12C racing, key members of McLaren Automotive’s design and engineering teams were eager to support this natural step at McLaren. Under the McLaren Orange skin, the 12C GT3 shares the same 75kg carbon ‘MonoCell’ chassis as the 12C road car. Since the modern McLaren was formed in 1981, the company has used only carbon fibre for the chassis construction of all its road and race cars: it was a natural choice for the heart of the MP4-12C. Lightweight construction and manufacturing innovation through Resin Transfer Moulding was a priority for the engineers and designers responsible for the 12C’s chassis. The result is a road car that, at1301kg**, is the lightest in the ‘core’*** sector of the high-performance sports car market. Andrew Kirkaldy said: “I believe the MP4-12C is an engineering masterpiece and that starts with its carbon chassis. A rigid chassis is hugely important to a racing driver. The McLaren MonoCell is unequalled as a safety cell, and our engineers can be sure that any changes made to the chassis set-up will have the desired effect because of its structural rigidity and predictability. “When Martin Whitmarsh first approached CRS Racing I was delighted that his main objective for McLaren GT was to make the needs of customers and drivers an absolute priority. That message transcends everything we are now undertaking. The development programme will be rigorous to ensure reliability, the technical specification of the 12C GT3 will surpass rival cars due to the links we have with Formula 1 technology suppliers, build quality will reflect the high standards introduced in the 12C road car, and the maximum performance will be accessible to drivers of varied experience levels. “Before McLaren GT, CRS was a customer of race car manufacturers. On occasion, it became accepted that GT cars are unreliable straight out of the box because manufacturers deliver cars before the technology is proven for racing. At McLaren GT we know expectations are higher. We want our customers to experience outstanding performance with metronomic reliability. Williams said: “McLaren GT is a smaller organisation than McLaren Racing, but we are applying Formula 1 methodology in every possible area. Martin Whitmarsh said: “We speak regularly with prospective customers for the 12C GT3 now and these relationships will only strengthen when teams take delivery of the 20 cars we plan to build for next season. Initial demand for the first 20 McLaren MP4-12C GT3s is high, with interest suggesting that McLaren and CRS Racing could sell the run five times over. However, neither company has any desire to stretch the market and lead to a risk of either oversupply or restrictions on customer service. Retained value in each GT3 car is also of high priority to McLaren and CRS, and the first customers when they take delivery. Looking further ahead, around 20 more GT3s plan to be built through 2013 and ’14, but both McLaren and CRS remain open-minded and optimistic about developing racing cars for other series’ and markets. In Formula 1, McLaren has won 170 races: better than one in four of the races in which it has competed since 1966, and more races won per season competed than any rival (3.75). These wins have resulted in eight Constructors’ Championships and 12 Drivers’ Championships. McLaren, and Ron Dennis’ influence on Formula 1 has been manifest. In 1981 (Dennis’ first season as team principal), the McLaren MP4/1 became the first-ever race-winning car featuring a carbon fibre-based monocoque chassis. 1993 - 1997: McLaren F1: The McLaren F1 was, and in many eyes remains, the definitive sports car: the first road car with a carbon fibre construction. Just 106 examples of this iconic supercar were made (72 road cars, 28 racing cars, six prototypes), but recent auction prices for F1s value the standard F1 road car at between £2 - £2.5 million, almost five times its original retail price: appreciation unheard of in a modern car. It was also the last true road car to win Le Mans and the first to achieve this feat since the ‘60s. 2003 – 2009: Mercedes-Benz SLR McLaren: The SLR was conceived and styled by Mercedes-Benz as a powerful, touring sports car before being presented to McLaren Automotive to engineer, develop and manufacture. The SLR was prodigiously fast, exclusive and a technological tour de force. With over 2,100 examples produced, the SLR became the most successful ultimate supercar ever built, selling twice as many as the next best-selling carbon based car (Porsche Carrera GT). 2011 - : McLaren MP4-12C: the carbon-based 12C goes on sale globally from June 2011 through 35 experienced premium car retailers in all regions. Up to 1,000 will be built in the cars first full year, hand-built in the brand-new £40 million McLaren Production Centre that is connected to McLaren’s Formula 1 headquarters in Woking, England. The 12C is the first in a range of high-performance sports cars from McLaren.